Diplomatic Missions to Cameroon and lovers of culture who were guests at the Royal Dance known in Babungo local language as “Nikai”, were, March 27, treated to a cultural festival. 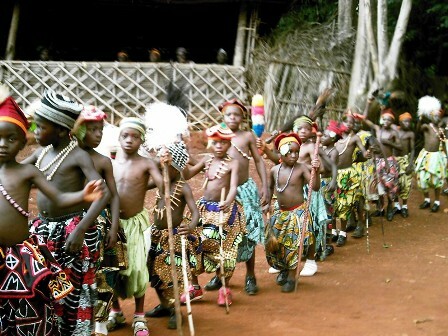 Strictly meant for men and young boys of Babungo Village in Ngoketunjia Division; bare boded men, including Fon Ibrahim Ndofoa Zofoa, held the population spell-bound, with rhythmic movements of muscles from head to toe, and swinging horse tail wands. 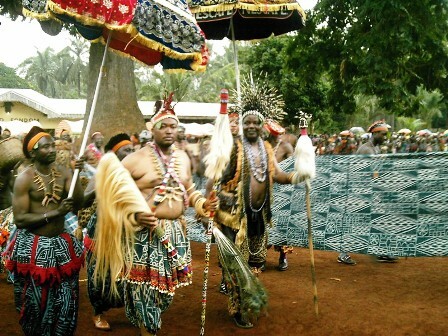 Leading over 1 000 men and about 200 children who emerged from the Palace shrine, including sub chiefs like Olivier Fuangwe Colday Ndofekeh, the Fon of Babungo danced round the Palace courtyard where the modern museum is situated, before disappearing into the woods of the shrine. The women had joined the men in an earlier “Samba” dance to officially welcome their guests who jammed the Palace premises. On behalf of His Majesty, Fon Ibrahim Ndofoa Zofoa, Fuangwe Colday Ndofekeh, appreciated the presence of the high dignitaries. He explained that the annual dance comes at the beginning of every planting season as a form of blessing for a bountiful harvest and fertility in young girls. “The Fon has asked me to inform you of the good things that Babungo Village received recently, notably; the appointment of General Martin Chomu Tumenta by President Biya as well as other socio-economic projects of which, we have pledged total support to him and the Government he incarnates,” Fuangwe Colday declared. Representing the Minister of Culture, the Northwest Regional Delegate of Culture, Ernest Chuinteu, said Minister Ama Tutu Muna could have loved to personally preside at the Nikai Royal Cultural Festival, but for State assignments in the U.S. He pledged constant technical support to the promotion of the culture of the Babungo people. An official from UNESCO, Vincent Seck, Specialist in Cultural Programmes, expressed satisfaction at the growth of the Babungo Palace Museum, which is second to none in the Northwest, and said his organisation will not relent in giving it full support.